Napoleon Bonaparte was the Emperor of the French and also the King of Italy as Napoleon I. 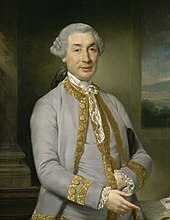 His actions shaped European politics in the early 19th century. The defeat of the Royalist rebellions ended the threat to the Convention and earned Bonaparte sudden fame, wealth, and the patronage of the new Directory. On March 9, 1796, Napoleon married Josephine de Beauharnais, a widow older than he was and a very unlikely wife to the future ruler. The Congress of Erfurt sought to preserve the Russo-French alliance and the leaders had a friendly personal relationship after their first meeting at Tilsit in 1807. However, on June 23, 1812, Napoleon went to war with Russia. 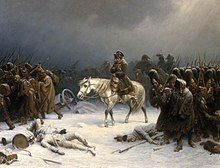 The French invasion of Russia defeated many Russian cities and villages, but by the time they reached Moscow it was winter. Due to the Russian army's scorched earth tactics, the French found little food for themselves and their horses. Napoleon's army was unable to defeat the Russians. The Russians began to attack. Napoleon and his army had to go back to France. The French suffered greatly in during Napoleon's retreat. Most of his soldiers never returned to France. His army was reduced to 70,000 soldiers and 40,000 stragglers, against more than three times as many Allied troops. Finally at the 1813 Battle of the Nations he was defeated by the Allies: Sweden, Russia, Austria, and Prussia. 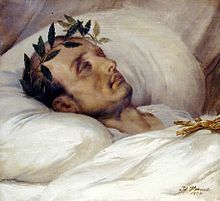 Wikimedia Commons has media related to Napoleon. ↑ He was called Nabolione in Corsican. ↑ McLynn, Frank (1998). Napoleon. Pimlico. p. 6. ISBN 0712662472. ↑ "Cathedral—Ajaccio". La Fondation Napoléon. Retrieved 2008-05-31. ↑ Beardsley, Martyn (2015). Waterloo Voices -1815. Amberley Publishing Limited. pp. vii. ISBN 978-1-4456-1990-3. Alter, Peter (2006). Tim Blanning and Hagen Schulze (ed.). Unity and Diversity in European Culture c. 1800. Oxford University Press. ISBN 0197263828. Archer, Christon I.; John R. Ferris and Holger H. Herwig (2002). World History of Warfare. University of Nebraska Press. p. 12. ISBN 0803244231. Asprey, Robert (2000). The Rise of Napoleon Bonaparte. Basic Books. ISBN 0465048811. Bertman, Sandra (2002). "Execution of the Defenders of Madrid, 3rd May 1808". New York University. Retrieved 2008-11-18. Bresler, Fenton (1999). Napoleon III: A Life. London: Harper Collins. ISBN 0002557878. Bruce, Evangeline (1995). Napoleon & Josephine, An Improbable Marriage. Scribners. ISBN 0806522615. Castle, Ian (1994). Aspern & Wagram 1809: Mighty Clash of Empires. Osprey. ISBN 1855323664. Dunan, Marcel (1963). "Napoleon's height" (in French). La Fondation Napoléon. Retrieved 2009-01-11. Fulghum, Neil (2007). "Death Mask of Napoleon". University of North Carolina. Retrieved 2008-08-04. Hanley, Wayne (2005). The Genesis of Napoleonic Propaganda, 1796–1799. Columbia University Press. ISBN 0231124562. Hanson, Victor Davis (2003). "The Claremont Institute: The Little Tyrant, A review of Napoleon: A Penguin Life". The Claremont Institute. Retrieved 2008-05-30. Hibbert, Christopher (1998). Waterloo: Napoleon's last campaign. Wordsworth Editions. ISBN 1853266876. Mari, Francesco; Elisabetta Bertol, Vittorio Fineschi and Steven B Karch (2004-08-01). "Channelling the Emperor: what really killed Napoleon?". Journal of the Royal Society of Medicine (The Royal Society of Medicine Press). http://jrsm.rsmjournals.com/cgi/reprint/97/8/397.pdf. Retrieved 2009-02-15. O'Connor, J; E F Robertson (2003). "The history of measurement". St Andrew's University. Retrieved 2008-07-18. This page was last changed on 25 March 2019, at 17:55.